Nine illegal miners have been rescued from a gold mine in Zimbabwe days after a burst dam flooded two shafts. They are reported to have survived by finding higher ground and waiting while up to their necks in water. Dozens are feared to have died 40m (130ft) underground since the accident happened on Tuesday night. The government has declared the accident near the town of Kadoma, south-west of the capital Harare, a national disaster. Miners say those trapped are mostly under the age of 24. A video taken by a Zimbabwe Broadcasting Corporation reporter showed a rescue team cranking a cable system by hand to pull one of the men out, tied to a rescuer. Hopes for the missing miners had waned during the four days since flooding started, as rescuers had to pump out large amounts of water, slowing their progress. "We are yet to assess and find any more people down there who are still alive," government deputy chief mining engineer Tapererwa Paswavaviri told reporters. Heavy rains on Tuesday night then destroyed a dam upstream and caused flooding in the soft ground. Anxious family members at the scene became frustrated with the slow pace, with one telling Reuters news agency that it was "so painful" to see many rescue workers present but no successful rescues. 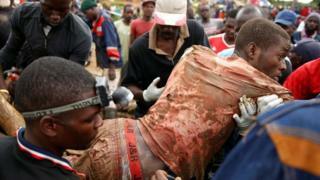 Previous mine disasters in other parts of Africa have cost the lives of numerous unauthorised miners.